Extrema Ratio has taken the full-sized MF2 as the basic pattern for a compact version of this popular folder. Extrema Ratio has named this smaller version, the “MF0” folder. Shorter but definitely not shorted on quality or features. The MF0 is ideal for an EDC. A strong, solid, compact folder that rides easily in your pocket. The compact sized MF0 is a good option if you need a shorter blade due to local laws or if you prefer a shorter, easier-to-carry blade. This version has the classic Testudo (black) finish and is offered with a drop point. This is a very durable finish that is very protective against corrosion and oxidation. The MF0 [MFzero] blade has been shortened compared to the other MF blades. This compact, clean blade shape is similar to the “leaf” shaped blade on the fixed blade Shrapnel OG. 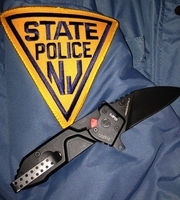 The blade is formed to include a lower guard with a lanyard hole. It has ambidextrous thumb stubs. The handle on the MF0 has been reduced as much as possible to a minimum length. Even though the handle is somewhat shorter than the other MFs, it has been designed to give you a good grip. A window breaker on the end extends beyond the bridge clip. There is a supplementary screw you can adjust for fine-tuning the knife action. The MF0 has a reversible side-to-side clip. This clip is a "bridge" clip that wraps around the end so the knife sits deeper in your pocket for a more discreet carry. It gives you a tip up carry.